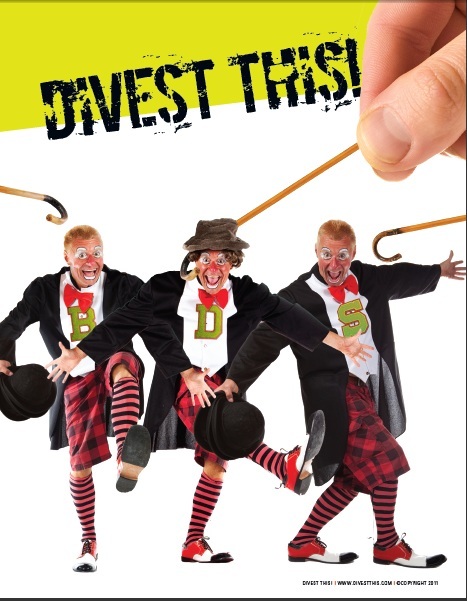 Happy New Year to all you DivestThis readers out there! I don’t know if it’s the new blogging platform, or the fact that this site is reaching the 500 post mark, but the depth of conversation over the last several months has really shot up, especially with regard to recent analysis over what makes the BDSers tick. For just as it is easier to understand certain concrete objects by looking at outsize examples of them (which is why we used to dissect large bullfrogs in high school, rather than tiny newts to understand animal physiology), so too can we see the contours of the multi-faceted “Big Ugly” by spending time (in the case of this blog, close to three years) looking at a BDS version of this Ugly which seems to consist of nothing but extremes. Another way of grasping what a phenomena is is by ruling out what it is not. And after so many years looking at BDS in action, I think it’s safe to say that we are not looking at a “movement” made up only of hate-filled hypocrites, liars and cranks who are primarily motivated by hatred of a Jewish state (or Jews generally) who hide their real motivation behind a façade of humanitarianism and global citizenship. Not that people who fit this description cannot be found within the “movement” (including its leadership), but I suspect such people are in the minority. For the behavior of the majority seems to indicate not a secret desire to do evil, but an unbending belief in their own goodness. Such an observation (presuming it’s correct – since descriptions of other people’s motivations can only ever be speculative) should only give us the coldest of comfort, however. For throughout human history, the majority of horrors have been carried out by those who believe themselves to be unquestionably in the right – to such a degree that arguments – and even objective facts – to the contrary cannot penetrate a hardened shell of self-righteousness. And it is to the subject of facts and arguments that we will move to next time. 4 Responses to Bigger Picture – What makes BDS tick? One point that I frequently like to make is the fact that the Nazis were not cartoon bad guys indulging in evil, but genuine idealists who believed that their political movement was entirely just and right. The same is true of progressive-left anti-Semitic anti-Zionists of the kind that tend to make up the BDS movement. They are convinced that the Jews of the Middle East have done a profound injustice to the “indigenous” population through violence, ethnic cleansing, and the appropriation of land. They therefore believe that in opposing these alleged injustices that they are doing G-d’s work, so to speak. It is for this reason that your notion of paradigm is important because the only possible way we can ever win the argument among western liberals is to present that argument within the context of Jewish history in the Middle East, rather than within the propagandistic anti-Israel paradigm that Israel’s western-left advocates tend (unconsciously) to use. One advantage to this conscious altering of the paradigm through the altering of the terms that we use is that it can better reflect historical truth. We do not need to resort to propaganda because historical truth is on our side. For 13 centuries the Jews of the Middle East lived under the boot of Arab-Muslim imperialism within a system of persecution known as dhimmitude. This is simply a fact of Jewish history and one that we ignore at our peril if we wish to make the moral case for Israel. Jon: some of the BDSers who comment on this site are testament to exactly what you describe– people who truly believe that they are standing up for an idealistic cause. One phenomenon that you didn’t address here (though perhaps you plan to do this in followup) is that those who comment here often appear to try to dissociate themselves from the most extreme aspects of BDS. For example, I seem to recall some BDSers stating that their goal wasn’t to eliminate Israel as the state of the Jewish people. The interesting part of this is that it’s not the mainstream of a movement trying to distance itself from extreme elements (as for example mainstream activists against the Iraq War gradually distanced themselves from the loony far left as represented by International ANSWER). These are people trying to claim that they aren’t supporting the very foundations of the BDS Movement as represented in the BDS Call and subsequent reiterations of it, and as frequently espoused by movement spokespeople such as Omar Barghouti. That foundation is very clear– no end of BDS until the end of Israel within any borders at all. So these people are either lying, or they have signed on to a movement without a clear understanding of what it is promoting. Unfortunately, the second can be just as dangerous as the first! They know it. Everybody knows it. And they don’t care. Not only they don’t care but I truly deeply believe there is nothing they would like better than see those single-passport-ed “Mizrahi” Jews disappear from the face of the earth, massacred. Meanwhile, they are virtually deleting them from consciousness. Did you see their history of the Israeli-Palestinian conflict? And Mike, that’s “Jews of the Middle East” AND North Africa. Speaking of shifting paradigms, is anti-Jewish boycott entirely a bad thing? Besides inventiveness, creativity and business savvy, what other advantages are there to those subjected to boycotts?